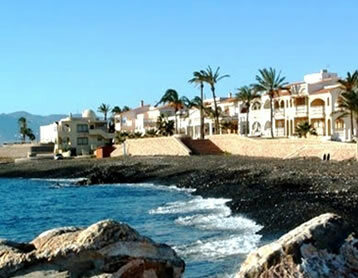 The principal towns in this zone of the Spanish Mediterranean coastline are the traditional, Andalusian, ¨white-washed¨ town of Mojacar; the fishing town of Garrucha; the extensive sandy beaches of Vera; the small fishing village of Villaricos, and the charming resort of San Juan de Los Terreros. The traditional inland towns of Nijar, Sorbas, Bédar and Albox can also be found within a half an hour drive from the coastline. 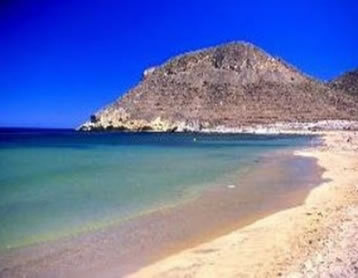 The provincial capital of Almería, and its international airport, lie within approximately 90 km to the south-west of Mojacar, and can be easily reached via the A7 national motorway. Mojacar is the most internationally known point of reference within the locality and it is divided into two distinct parts; the elevated traditional white-washed town of Mojacar, and Mojacar Playa, which is a ¨blue-flag¨ beach resort that includes an established, 18-hole golf course, known as Marina Golf. 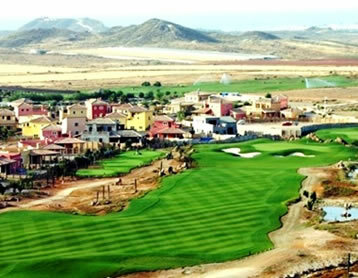 Other well known golf and residential resorts within the area include Playa Macenas Beach and Golf, Desert Springs, Valle del Este, and Cortijo Grande. 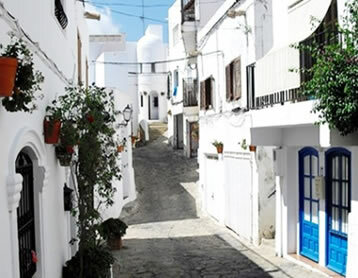 The town of Mojacar has been populated since the Bronze Age, being inhabited over the ages by Phoenicians, Carthaginians, Greeks and the north African Moors, which were expelled during the 15th Century during the ¨Reconquista¨. The name of the town originated from the Greek name Murgis-Akra and developed through Latin and Moorish to become Mojacar. 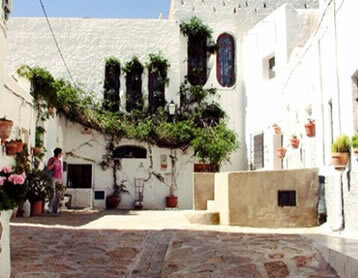 The town is the origin of the ¨Indalo-Man¨ symbol, which dates from pre-historic times and has come to signify the whole of the Almería province. The symbol is said to bring protection and good luck and has been exported to other European countries through tourism; the industry that drives the local economy. 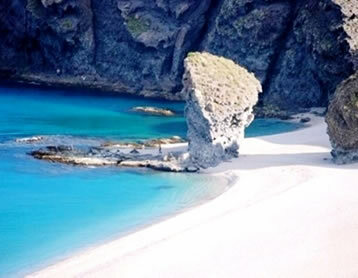 The southern part of this zone offers a terrestrial-maritime National Park known as ¨Cabo de Gata¨, which covers the coastal part of three municipalities, extending to 63 km and covering a land area of 37.500 hectares with a maritime area of 12.000 hectares. The park has the highest level of ¨special protection¨ in Spain and is one of the few volcanic zones with such protection. 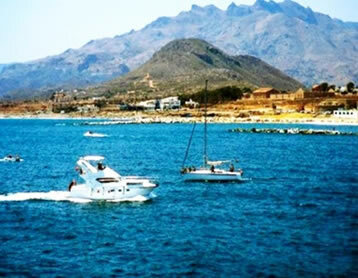 The Natural Park is dotted with traditional fishing villages, including; Las Negras, Agua Amarga, Isleta de Moro, San Miguel and San Jose. 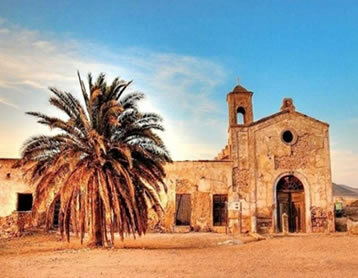 Other villages of interest are Rodalquilar, where the ruined remains of a gold mine can be visited; Pozo de Los Frailes, with its traditional water mill, and Los Albaricoques which is a traditional village and film location for spaghetti westerns such as ¨For a few dollars more¨ and ¨The Good, the Bad and the Ugly¨. The coastal scenery within the park is exceptional, and there are many observation points which give clear views of natural rock formations such as those at Los Escullos and Monsul Beach - and of natural beaches such as Playa de los Muertos and Los Genoveses. Needless to say, the park also has a rich variety of birdlife and fauna for environmentalists to explore.